NORTH WILKESBORO, N.C., August 4, 2015 — Window World, America’s largest replacement window and exterior remodeling company, is a proud sponsor of DIY Network’s Blog Cabin Giveaway for the third year in a row. 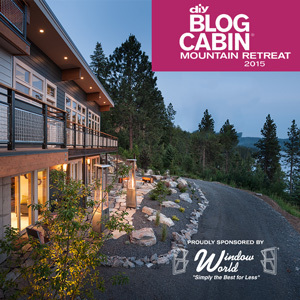 People are encouraged to enter on Window World’s website to be in the running to win a completely furnished cabin in Coeur d’Alene, Idaho, along with a $50,000 cash prize provided by Quicken Loans. This year, Window World doors and windows were utilized in the construction of the modern mountain home. The products that were used included: 47 Desert Clay Colored Windows, 8 Desert Clay Colored Patio Doors, one entry door and one garage door. The cabin was built using contemporary design elements and features a modern look that makes it cozy, yet impressive. The DIY Network created the Blog Cabin Giveaway series based on three ideas: You Design It, We Build it, You Could Win It. Viewers are given the opportunity to express their creativity by voting for designs and get to watch as their vision comes to life through the captivating show. The grand prize package has a total value of $900,000. Submissions began at the end of July and are running through Sept. 11, 2015. DIY Network, from the makers of HGTV and Food Network, is the go-to destination for rip-up, knock-out home improvement television. Currently in more than 58 million homes, DIY Network’s programming covers a broad range of categories, including home improvement and landscaping. The network’s award-winning website, DIYNetwork.com, consistently ranks among America's top home and garden Internet destinations for entertaining videos, home improvement advice, step-by-step instructions, message boards, blogs, an interactive program guide and more. Headquartered in Knoxville, Tenn., DIY Network is wholly owned by Scripps Networks Interactive, Inc. (SNI).